Sebastian Vettel is confident Ferrari has “got the ingredients” to finally end its spell without a F1 world championship title in 2019. Sebastian Vettel believes Ferrari has “got the ingredients” to finally end its spell without a Formula 1 world championship title in 2019. Ferrari has not won a world title of any description since 2008 but turned in its strongest campaign since last year, only for a series of driver errors and operational failures to accelerate a second successive defeat to Mercedes and Lewis Hamilton. The Italian team has undergone a major management reshuffle over the winter, with former technical head Mattia Binotto replacing Maurizio Arrivabene as team principal, while Ferrari has altered its driver line-up for the first time since 2015 by promoting Charles Leclerc alongside Vettel for the new campaign. “We’ve got the ingredients and it’s down to us to do the job,” Vettel said at the Race of Champions in Mexico City. “It’s difficult to say at this time of year. Everybody’s still in the dark, we’re waiting for the cars to come and then get a feel and we’ll see in the first race. 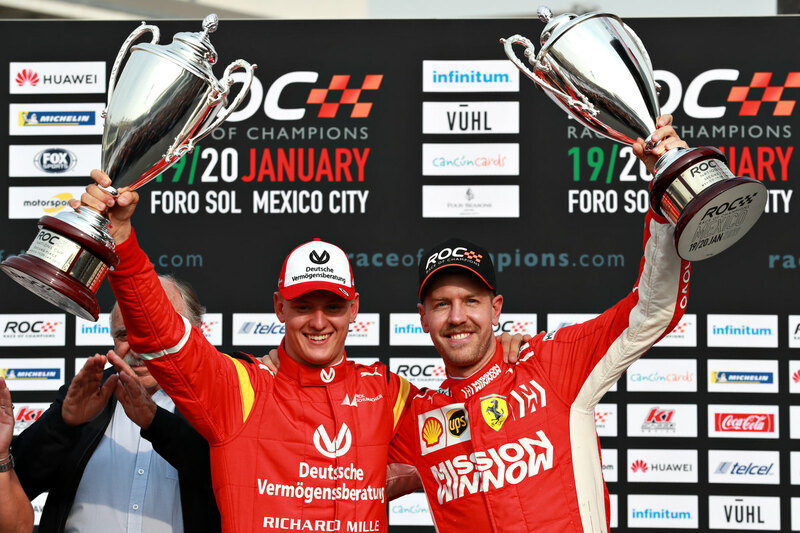 Vettel teamed up with recently-announced Ferrari Academy member Mick Schumacher at the latest edition of the ROC but the pair were unable to successfully defend Germany’s Nations Cup title, losing to Team Nordic duo Tom Kristensen and Johan Kristoffersson. The reigning European Formula 3 champion impressed on his ROC debut and also beat Vettel in the head-to-head rounds of the individual heats. “It’s a long year ahead of us and maybe not the start I was looking for,” Vettel joked. “It’s a fun event and I think we’ve had fun and it’s great to be here. “At the end I think only one can win so I think all the rest of us, we are in a way disappointed. But that’s the name of the game. “I think it was a fun competition, I would have liked to go a bit further, to drive a bit more, but sometimes it’s like this. Asked if he felt Schumacher could follow in the footsteps of his father, seven-time world champion Michael and be a star of the future, Vettel replied: “I think so. Give him time.